If trends are to be believed, UK residents are doing exceedingly well as far as recycling and waste management at home are concerned. While that certainly is good news, there is also cause for concern that workplaces in Britain are still some distance away from fully implementing environmentally friendly office practices. At the same time, there is no doubt that getting a workplace and its people to follow recycling practices is an uphill task. Most recycling best practices require people to change their routines and go the extra mile, which is something that many are resistant to. This is where the concept of incentivising recycling practices comes in. It refers to ways in which employees can be encouraged to recycle and manage waste in an eco-friendly manner. While some of these involve fun, others are designed to work at a subconscious level. If you are part of a workplace that aims to be more efficient and eco-friendly in waste management, the points explained below will prove useful. Starting small is always a good idea and it’s no different with green office ideas. 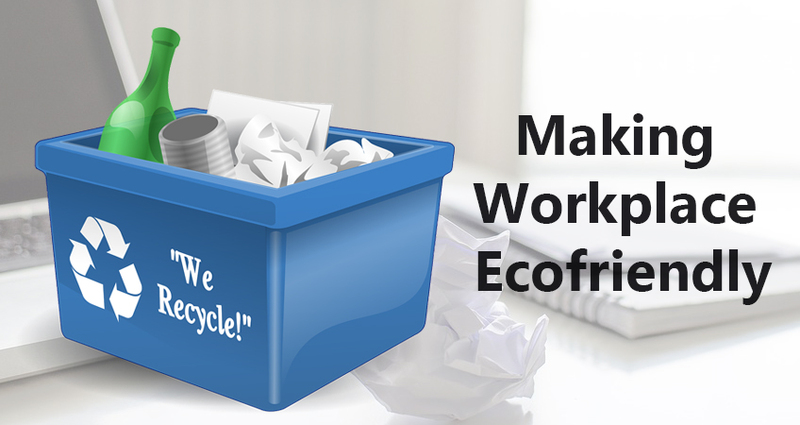 Get your employees together and inform them that a new recycling project is about to start. While at it, present a list of items that will be a part of this project. Start with the obvious ones like paper and beverage containers before moving onto other items. You can underpin the project further by sending out an official email that also contains a list of things covered by the recycling project. Pasting a physical note written in eye-catching colours is not a bad idea either. That said, follow up on the advertising by doing what’s necessary, which in this case means putting up easily identifiable and usable recycling bins. Also, make sure the transition (if any) from non-recyclable to recyclable materials doesn’t hamper employees’ workflow. Remember that simpler the changes, easier it is for employees to get used to them. Let’s get it out of the way that recycling and waste management are no fun, unless of course, you are passionate about them. That alone is reason enough why you should do everything you can to make recycling at your workplace fun. Enter games and fun events. Not every educational event has to involve presentations or talks or even seminars. For instance, you can organise a free-throwing game at your workplace where the waste is first sorted and then thrown into the right bin. All paper waste has to go into the blue bin, plastic bottles and containers in green bins, and aluminium cans and foil into a yellow bin. Another idea is to install a basketball hoop above each bin. So every time an employee wants to discard some paper, bottle, or other recyclable, they can do so by shooting through the hoop. To sum it up, make green initiatives in the workplace as fun as possible. Getting a recycling competition going is another smart way to boost your workplace’s recycling project. Have each employee save up their days’ worth of recyclable materials and at the end of the day, use a weighing scale to measure how each employee has fared. Offer prizes for the most contribution to your recycling project and acknowledge them publicly. If your workplace is larger and has different departments, make it a team effort that’s judged weekly or even fortnightly. Eco-friendly office ideas like games and competitions might sound more suitable for schools. However, they have been shown to be useful in getting grown-ups excited about what is obviously a dull topic. The move towards a green office space can be hastened by getting professional help on-board. There are loads of professionals and firms that specialise in waste management for workplaces. They not only design a recycling program for your workplace but also provide extensive education and hands-on training to your employees. Typically, a waste management firm begins by performing a waste audit of your workplace. The audit helps you learn how to sort, process, recycle, and minimise the waste generated by your office. Getting professional help also sends out a message to your employees that you are serious about implementing workplace sustainability ideas. Fostering environmental practices in the workplace is a journey and not the destination itself. It will take time as breaking old habits and routines is hard. Which is why it’s so important to keep the communication going with your employees all the time. Keep informing them how recycling is in their best interests and how their efforts contribute to the bigger picture. Use trivia where possible to get them interested in recycling; like how recycling even one aluminium can produce energy that is enough to run a laptop for three hours straight or how a tonne of recycled paper directly saves 17 trees, over 20,000 litres of water, close to 30 sq. ft. of landfill space, and almost 1,500 litres of oil. As you go about implementing these ideas in your workplace, remember that most people want to do the right thing and all they need is a slight nudge in that direction.